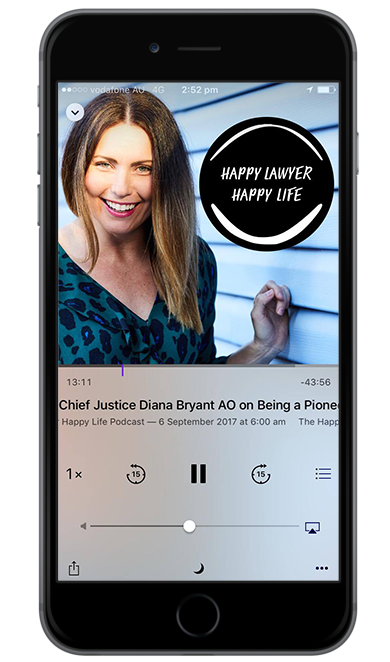 In this week’s episode of the ‘Happy Lawyer Happy Life Podcast’ I had the pleasure of interviewing Commercial Barrister Matthew Jones. Matthew was such a joy to interview and has a wonderful outlook on life. This conversation took us from his dream to be Nicole Kidman (I am sure that is what you said Matthew!) to his now role as President of LawRight. His happiness tip is one that rings so true for all of us – we need to work in the law so we can have a life outside of the law, not the other way around. Matthew has had some back and forth in his legal career and never planned on becoming a Lawyer, let alone a Barrister. He has had to overcome some challenging moments that have made him question if life in the law was really for him, however fast forward a few years and now he would not do anything else. His advice on how he overcame career challenges is so helpful for us all. He works primarily in the area of commercial litigation and described to me why he really enjoys the ‘intellectual puzzles’ that he gets to solve in this arm of the profession. Matthew is the President of Law Right – a not-for-profit organisation helping those who cannot afford legal services. He encourages all solicitors and Barristers alike to take on one pro-bono case a year. Matthew would be an international translator if he was not a lawyer . Growing up, Matthew’s father was in the Army and as a result he spent much of his childhood moving around. Following his studies, Matthew applied for many jobs and received a role in a small firm initially working in conveyancing- this gave us both some laughs as we remembered ‘those days’ in the settlement rooms! Matthew then spent the early years of his career working in commercial litigation learning from some of the best in Brisbane. It was on his honeymoon that Matthew decided to try life at the Bar and he hasn’t looked back since. Mistakes that we all make in our careers and how they can made into learning oppotunites. How Matthew has learnt to deal with the stress of the job and his tips for others. Having the confidence within yourself to back yourself and your career. Matthew loves the ‘puzzle’ of being a barrister and thrives on the challenge. Matthew shared an entertaining story of his 93 Commodore and working in the back of his car while working towards becoming a Barrister. Pro-bono work and Matthew’s encouragement to students, Barristers and Solicitors to conduct this work. Being involved on a board and how much it teaches you, including connection to you to your colleagues. The sense of justice and the driving force of helping others. The importance of being a kind person and enjoying life outside of the law. The connection between personal happiness and professional performance.